As I’ve stated previously, I enjoy these books, partially because I get a certain weird amount of fun out of reading the strange old days of DC’s Silver Age, and because I don’t mind the black and white. Not only do I find it to be an acceptable trade-off for the ream of comics that I am getting, but also sometimes I find it strangely more rewarding to have to “plow through” the black and white art than to have it all fed to be me in normal color. It’s almost like it gives the stories a classic feel, even in actuality they are silly and dated. Story Breakdown: There are 46 stories in this volume, many of which, like in Volume 1, are quite short – usually 8-9 pages in length, although one is only 7 pages long. There are a few longers ones, and a couple of two parters. • An appearance of the Super-Univac, Superman’s computer which can, amongst other things, show fictional re-creations of imaginary events extrapolated from input and data. 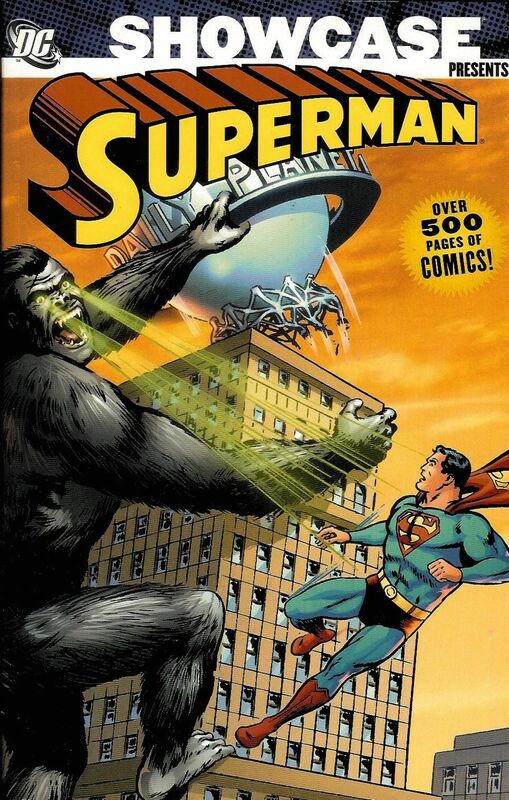 It actually debuted in the last Volume of Showcase Presents Superman, but I didn’t know it was a thing then. -Superboy’s first public appearance (where he was instrumental in preventing someone from wrongly dying on death row, similar to what he did in Superman’s first ever appearance in Action Comics #1). Its also involved him meeting the President of the USA, who I thought at first looked like Franklin Delano Roosevelt (and I have seen several sites which refer to this character as FDR) until he was shown walking! Looking it up, I see that he looks even more like Harry S. Truman, Roosevelt’s successor who was president from 1945 – 1953, or 16-8 years prior to this story being published, which seems to fit a Superboy chronology. • The Night of March 31st! – A famous DC Comic story in which the creative team decided to pull an April Fool’s Day joke on the readers by penning a story in which everyone acts out of character, and which was full of intentional editorial mistakes. 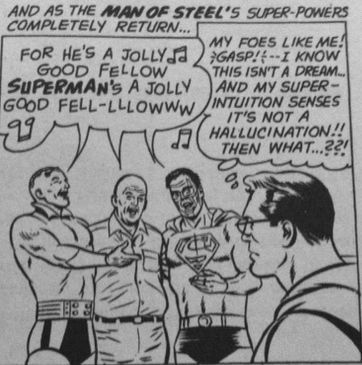 There was even a mistake in the text explanation for what is going on, as it gives Jimmy Olsen’s signal watch making a different sound effect as an example of the intentional mistakes…but Jimmy Olsen’s signal watch does not turn up in the story! • The Kandorians show up a few times. We have a Kandorian impersonating Superman, just as one impersonated Jimmy Olsen in the last volume. And Kandorians warning Superman of various dangers. 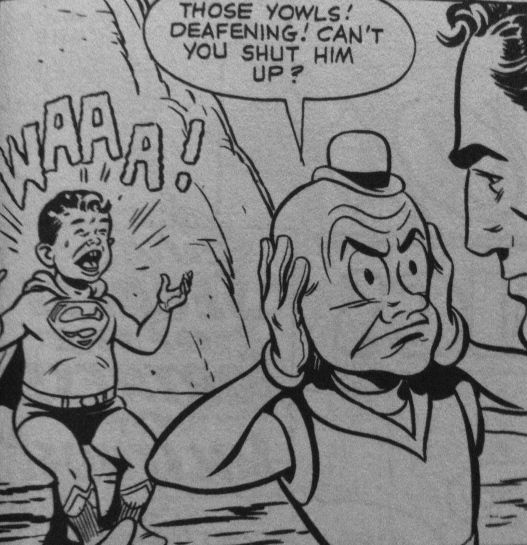 • Superman overhears people talking in space! Also, he kisses Supergirl…a couple of times. And he still refuses to let her leave the orphanage, as his secret weapon. • Clark Kent accidentally goes to another dimension with his friends, where he loses his powers. Inexplicably, he decides to turn up as Superman there, but then has to spend all his time pretending that he’s still powered. • A story about Superman having to make someone laugh! • A story about a force-created duplicate of Superman that lands on earth at the same time that he does, is adopted by crooks and grows up as a bad guy. He eventually fights Superman, becomes disillusioned, and then destroys himself, taking out the crooks who raised him at the same time. 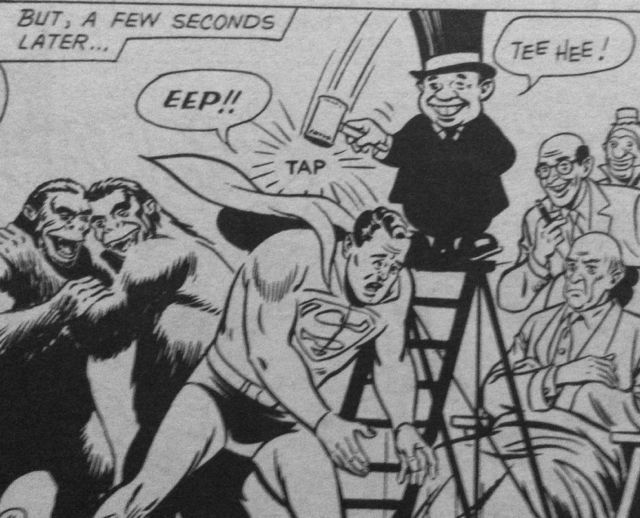 • A bunch of Bizarro’s – including a dream sequence in which Superman imagines being turned into a Bizarro. Later, Bizarro comes to earth, jealous that people are more afraid of the Frankenstein monster than they are of him. • HyperMan – a Superman of another world. He’s dying, as Superman learns from his Super Univac, but he doesn’t tell him. • Several appearances by Superman’s special lead suit that protects him from Krytponite, which had also shown up already in the previous volume. • A story in which Superman dreams of being an old and forgotten man – another one of those almost “Imaginary Stories”, but with a framing device to justify it. • Both Lori Lemaris and Krypto make separate attempts to convince Superman to propose to Lois. Krypto almost inspires Superman to propose to Lois by showing that he is happily in love with another puppy! • Batman shows up to help Superman protect his identity. So does Aquaman. • Lois comes to think that Superman’s secret identity is actually science fiction writer Rock Stirling, host of the TV show “Unknown Worlds” – an obvious Rod Sirling analogue, except that he is in a wheelchair. Comments: The second volume of Showcase Presents Superman is a lot like the first one, in terms of story length and style, except that the series is slowing inching its way toward greater sophistication. There are less stories that are entirely about Superman protecting his secret identity, mostly because they’ve managed to expand the scope of Superman-level threats by this point. 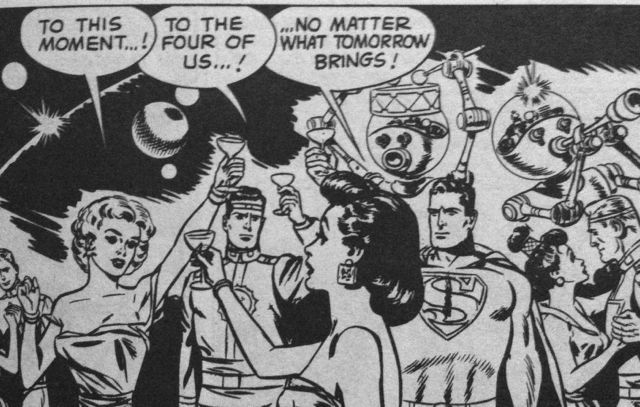 To wit, Superman’s rogue’s gallery now includes, in addition to old faithful Lex Luthor, the “notorious space-outlaw” Brainiac, Titano the super-ape with Kryptonite vision, Mr. Myxyzptlk, and Bizarro. I guess you could also include Hercules, although he only appears in one two-part story here, and the less impressive Anti-Superman Gang. Whether it was due to one of these threats or do some other story innovation, it felt like we had more stories where there was a genuine challenge for Superman to face. There’s a slowly increasing supporting cast, as well, as in this volume we get Lois, Jimmy, Perry White, Supergirl, Krypto, Jor-El, Lara, Lori Lemaris, Ronal, Jonathan & Martha Kent, Lana Lang, and Bizarro (I know, he was also on the villain’s list, but he really serves as both) & Bizarro Lois-Lane, all turning up multiple times. Lucy Lane also sneaks in there at least once. There were also a number of odd stories involving Lois Lane’s love life. In one, she is proposed to by a human from the future, where everyone has mutated into strange aliens. In the 20th century, he un-mutates into a good looking guy, so Lois agrees to marry him. But when they return to the future, both Lois and the guy mutate again, which makes Lois miserable. So the poor fellow sacrifices himself so that Lois can return to her home. 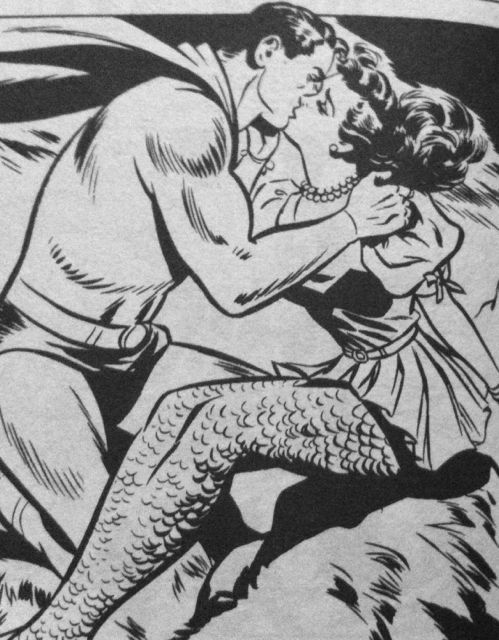 In another story, Superman & Lori Lemaris hatch up a plan in which they pretend that Lori’s husband has died, and that Superman is finally going to marry her and quit living on the surface world all together, and even turns himself into a merman to facilitate this. This turns out to be all to convince Lois to get on with her life and marry this rich, good looking dude who loves her, but Lois, being who she is, isn’t having any of it and turns the guy down. And when she finds out the truth, she just takes that as further evidence that Superman cares for her enough that maybe he’ll marry her someday. In another story, Superman enlists the help of Aquaman to make it seem that Lois Lane’s comic strip creation (!!) has come to life – a hero called Mental Man. Mental Man starts to romance Lois, but it’s all a ploy to capture some crooks, of course. And because it was for a good purpose, Lois isn’t bothered. There’s even a bit of a meta-reference here, as Lois finishes off her strip by having Mental Man marry his love-interest (“Laura Lovely”) which apparently causes everyone to lose interest in the strip and have it dropped from all the newspapers. But to my thinking, the most interesting Lois-Romance story is the one in which she suddenly finds that Superman’s powers have transferred to her, leaving the hero powerless. She decides to get back at him for all his years of stringing her along and refuses to marry him for the standard “in case it would endanger your life” shtick. 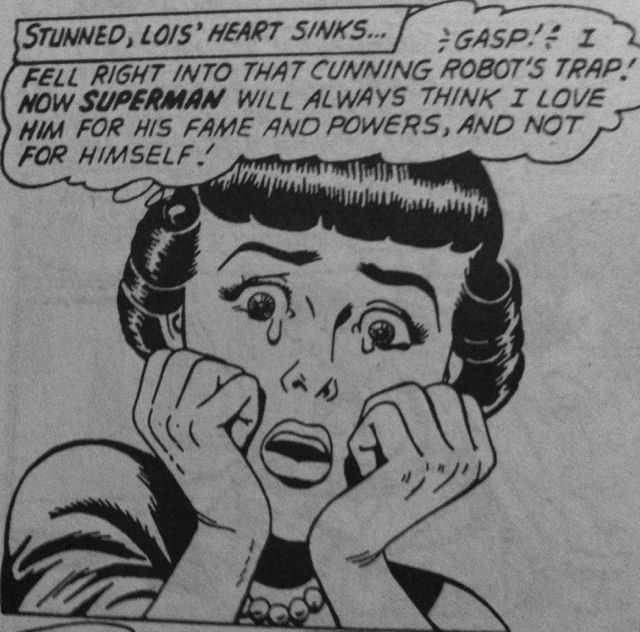 But then the twist is it isn’t Superman at all – it’s one of his robots who has decided to prove to Superman that Lois doesn’t really love him for who he is, but just for his great powers! And of course, basically, he’s proven her right! Lois’ expression at realizing what’s happened is amazing. Naturally, it all works out because Superman comes along and basically says that Lois had done the right thing by turning his powerless self down. But keeping in the romance vein, there are also a few very interesting tales about Superman’s love life, aside from Lois Lane. Least importantly, there is a story in which Superman is forced to marry a beautiful space princess, but he is able to eventually annoy her so much that she agrees to have the marriage annulled. It’s all a bit of fluff, but notable because Superman does actually get married here. More potently, there is the second Lori Lemaris story, which truly serves as the sequel to her debut in the previous volume. Here we see that Superman has not at all forgotten about his love for Lori, and is desperate to reunite with her. He does, but she refuses him (but only after some serious kissing), yet still agrees to spend the evening with him on a last date. At the end, she gives in, and they agree to do whatever they have to do to get married. But then Lori is critically injured by a crazy fisherman (Hans Schmidt, mentioned above) and ends up falling in love with her doctor (Ronal, also mentioned above) who after this becomes her husband. It makes for an abrupt end to what was shaping up to be the story of the ultimate Superman romance – he was willing to forsake the surface world forever for her, and everything. After that, Lori continue to appear, but always as a supporting cast member, and there romance is never renewed (except in that story mentioned above where they faked it to get Lois to marry someone else). The whole thing holds up pretty well and can be considered something of a Silver Age masterpiece.